*The set shown in this photo is a prototype, the figures and color of the furniture are different that those listed in our accessories list. 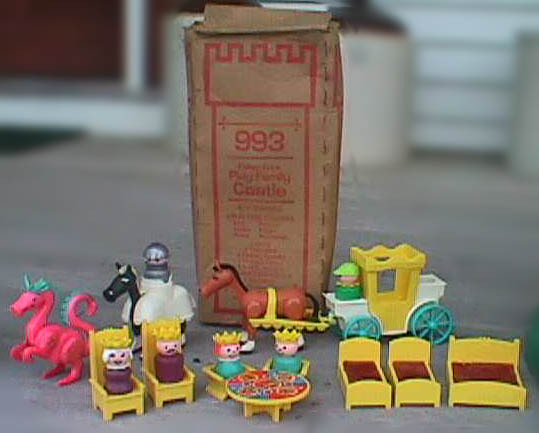 Description: If you were to ask 10 collectors what their favorite Little People set is, 9 out of 10 would probably tell you without a second thought: the Castle. 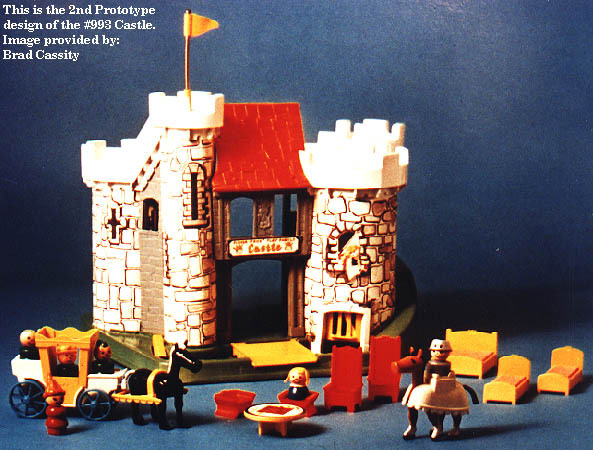 Introduced in 1975, the castle was the most detailed--not to mention the heaviest--Little People set to ever be created. It was undoubtedly also the most expensive to produce, something that might explain the mere two years in production despite the overwhelming popularity. Trap doors, dungeons, sliding stairs, working drawbridge, dragon chambers--all of this added up to a lot of fun for children at the time...and a lot of headache for people who have to clean a base now. Still, Fisher-Price's usual Achilles Heel is present in the design of the sliding staircase. There's a sharp plastic sliding stairway with no padding on the bottom. What does it slide over? A lithograph! Suffice to say, bases without stair-scrapes are rare to find nowadays. 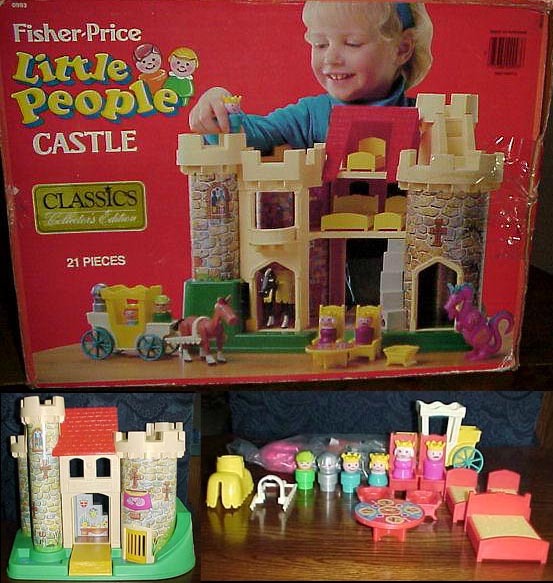 After a decade of being out of production, Fisher-Price issued the "Classic Edition" castle in 1988 with the same model number. 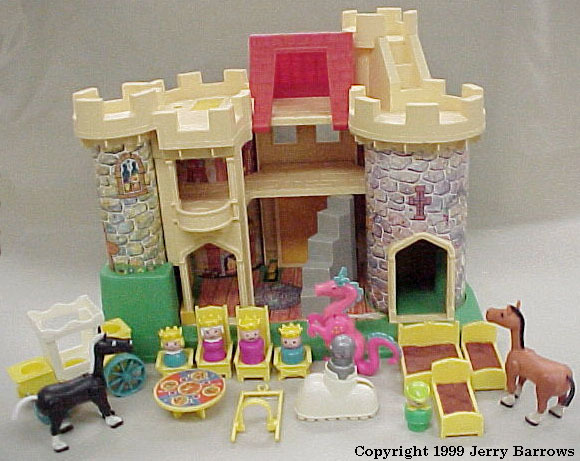 It followed the original playset very closely, with few alterations. The main difference was that the building no longer had a spring and flag on top of the turret, and all of the figures were all-plastic, oppose to the wood-plastic figures used in the '70s. B993A - Castle Base - Large Castle with a green base, paper litho walls with grey and brown stone designs. The Castle has 4 yellow/tan towers and WITH a triangular plastic TURQUOISE flag on the end of a long spring "pole" on the tallest tower. *See "Variations" below. Tall narrow cardboard box that has a red outline of a turret on the side. This was originally designed to hold the castle pieces, like the #915 Farm's silo, but was far less durable. This is very hard to find! We don't know if this was sold only one year, or all years that the Castle was made. FPT490 - White 3-seat Royal Carriage. The center seat is enclosed within a tall square Yellow "royal seat" area. The area under the "driver" seat (lowest seat) has a C-shaped hook (to connect to accessory harness). Rolls on 4 turquoise blue "wagon-spoke style" wheels. FPT128 - Yellow squared plastic double bed. The bed has a raised rounded headboard and a slightly raised rounded footboard. The top center of the headboard has a 3-point crown design. The bed has 4 short rectangular legs (one on each corner). The top of the bed was originally sold with PINK foam padding. The original foam padding tends to disintegrate over time. Size: 2-3/4" long, 2-9/16" wide, 3/4" tall. *See "Variations" below. 2 each - FPT1606 - Yellow rectangular single bed. The bed has a raised rounded headboard and a slightly raised rounded footboard. The top center of the headboard has a 3-point crown design. The bed has 4 short rectangular legs (one on each corner). The top of the bed was originally sold with PINK foam padding. The original foam padding tends to disintegrate over time. *See "Variations" below. FPT775 - 2 each - Dark Red TALL throne chair with a "crown" on the top of the backrest. 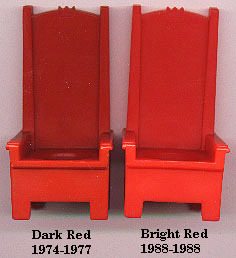 FPT774 - 2 each - Dark Red SHORT throne chair with a "crown" on the top of the backrest. FPT213 - Round Yellow table with a RED & BLUE STEAK MEAL LITHO on the flat top surface. FPT908 - Yellow Royal horse harness. The harness has 2 long straight sides that are squared on the end. The squared end fits behind the horse tail and has a C-shaped hook to attach to a cart. The long straight side ends of the harness are connected with a small U-shape that fits over a horse's back. The bottom edge of the harness has a "scalloped" decorative look with 7 rounded scallops on each of the 2 long straight sides. FPT910 - White fancy decorative Royal horse saddle/body armor with a raised round Original Little People figure hole on top. The saddle/body armor is a bit oval-shaped, rounded on the front and back, and has a rounded "scalloped" bottom edge. The rounded front of the saddle/body armor has a long narrow hole to allow a horse head and neck to move up and down. The rounded back area of the saddle allows the horse tail to stick out. UM - Dark brown horse with a black mane, tail, and facial features. XI - Black horse with a white mane and tail. WZ - Pink dragon with a jointed head, tail, arms and legs. He has yellow spots on his shoulders and hips and a row of turquoise scales down his neck and tail. He also has long turquoise ears that had a strong tendency to break off. A dragon with ears intact is very hard to find. DBWP - King - Purple man with a yellow crown. GAWP - Queen - Purple woman with a yellow crown over white hair with a bun on each side. EKWP - Prince - Turquoise boy wearing a yellow crown. GVRWP - Princess - Turquoise girl wearing a yellow crown over red hair. DZPP - Knight - Silver man wearing a silver helment over his head/face. BTWP - Woodsman wearing a lime green or cap. 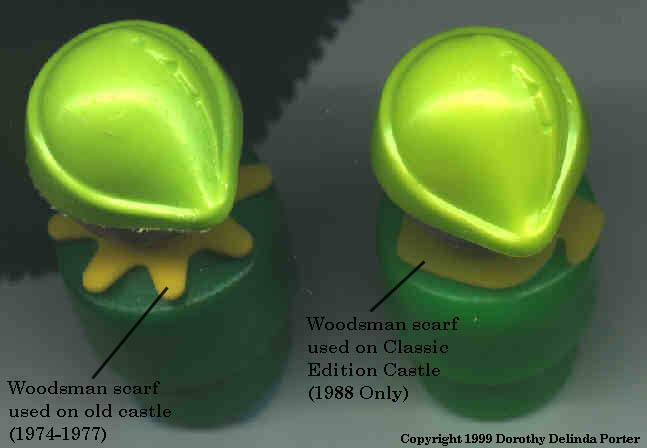 The woodsman's collar looks like a star from top view. Click here for illustration. *See Variations below. FPT166 - 2 each - Yellow TALL throne chair with a "crown" on the top of the backrest. FPT167 - 2 each - Yellow SHORT throne chair with a "crown" on the top of the backrest. UM or UN - Dark brown horse with a black mane, tail, and facial features. XI or XJ - Black horse with a white mane and tail. FPT124 - Dark red squared plastic single bed. The bed has a raised rounded headboard and a slightly raised rounded footboard. The top center of the headboard has a 3-point crown design. The bed has 4 short rectangular legs (one on each corner). The top of the bed was originally sold with YELLOW foam padding. The original foam padding tends to disintegrate over time. Size: 2-3/4" long, 2-9/16" wide, 3/4" tall. *See "Variations" below. 2 each - FPT1547 - Dark red rectangular plastic single bed. The bed has a raised rounded headboard and a slightly raised rounded footboard. The top center of the headboard has a 3-point crown design. The bed has 4 short rectangular legs (one on each corner). The top of the bed was originally sold with YELLOW foam padding. The original foam padding tends to disintegrate over time. *See "Variations" below. FPT207 - Round Dark Red table with a RED & BLUE STEAK MEAL LITHO on the flat top surface. FPT907 - White horse harness. The harness has 2 long straight sides that are squared on the end. The squared end fits behind the horse tail and has a C-shaped hook to attach to a cart. The long straight side ends of the harness are connected with a small U-shape that fits over a horse's back. The bottom edge of the harness has a "scalloped" decorative look with 7 rounded scallops on each of the 2 long straight sides. FPT911 - Yellow fancy decorative Royal horse saddle/body armor with a raised round Original Little People figure hole on top. The saddle/body armor is a bit oval-shaped, rounded on the front and back, and has a rounded "scalloped" bottom edge. The rounded front of the saddle/body armor has a long narrow hole to allow a horse head and neck to move up and down. The rounded back area of the saddle allows the horse tail to stick out. XM - Dark brown horse with a black mane, tail, and facial features. XK - Black horse with a white mane and tail. FPT763 - Yellow 3-seat Royal Carriage. The center seat is enclosed within a tall square White "royal seat" area. The area under the "driver" seat (lowest seat) has a C-shaped hook (to connect to accessory harness). Rolls on 4 turquoise blue "wagon-spoke style" wheels. B993B - Castle Base - Large Castle with a green base, paper litho walls with grey and brown stone designs. The Castle has 4 yellow/tan towers WITHOUT a flag on the tallest tower. XN - Dark brown horse with a black mane, tail, and facial features. XL - Black horse with a white mane and tail. FPT40038 - Pink dragon with a jointed head, tail, arms and legs. He has DARK PINK spots on his shoulders and hips and a row of dark pink and turquoise scales down his neck and tail. He also has long turquoise ears that had a strong tendency to break off. A dragon with ears intact is very hard to find. Arms, legs, and tail are made of soft (semi-bendable) pink plastic with dark pink spots. DZPP - Silver knight wearing a silver helmet. JQPP - Light green body woodsman wearing a lime green cap. The woodsman's collar looks like a farmer's scarf. (Click here for illustration). These royal people have plastic bodies and plastic heads. B993A - Castle with a turquoise flag on the tallest turret. B993C - Castle with a yellow flag on the tallest turret. B993D - Castle with a green flag on the tallest turret. *Note - B993B - Castle with NO FLAG on the tallest turret is the 1988 Classic Edition. 1974-1977 - FPT124 - Dark red double bed. 1988-1988 - FPT1226 - Bright red double bed. 1974-1977 & 1988 - FPT128 - Yellow double bed. 1974-1977 - FPT110 - Dark red single bed. 1988-1988 - FPT1225 - Bright red single bed. 1974-1977 & 1988 - FPT116 - Yellow single bed. 1974-1977 - FPT775 - 2 each - Dark Red TALL throne chair with a "crown" on the top of the backrest. 1974-1977 - FPT774 - 2 each - Dark Red SHORT throne chair with a "crown" on the top of the backrest. 1988-1988 - FPT168 - 2 each - Bright Red TALL throne chair with a "crown" on the top of the backrest. 1988-1988 - FPT169 - 2 each - Bright Red SHORT throne chair with a "crown" on the top of the backrest. 1974-1977 & 1988 - FPT166 - 2 each - Yellow TALL throne chair with a "crown" on the top of the backrest. 1974-1977 & 1988 - FPT167 - 2 each - Yellow SHORT throne chair with a "crown" on the top of the backrest. 1974-1977 - FPT207 - Round Dark Red table with a RED & BLUE STEAK MEAL LITHO on the flat top surface. 1988-1988 - FPT1224 - Round Bright Red table with a RED & BLUE STEAK MEAL LITHO on the flat top surface. 1974-1977 & 1988 - FPT213 - Round Yellow table with a RED & BLUE STEAK MEAL LITHO on the flat top surface. 1988 ONLY - FPT908 - Yellow Royal horse harness. The harness has 2 long straight sides that are squared on the end. The squared end fits behind the horse tail and has a C-shaped hook to attach to a cart. The long straight side ends of the harness are connected with a small U-shape that fits over a horse's back. The bottom edge of the harness has a "scalloped" decorative look with 7 rounded scallops on each of the 2 long straight sides. 1988 ONLY - FPT910 - White fancy decorative Royal horse saddle/body armor with a raised round Original Little People figure hole on top. The saddle/body armor is a bit oval-shaped, rounded on the front and back, and has a rounded "scalloped" bottom edge. The rounded front of the saddle/body armor has a long narrow hole to allow a horse head and neck to move up and down. The rounded back area of the saddle allows the horse tail to stick out. STWP - The Woodsman used in the 1970's could also have a yellow cap opposed to lime green. The 1974-1977 set was sold in a 17" wide, 13-1/2" high, 12-3/4" deep box.